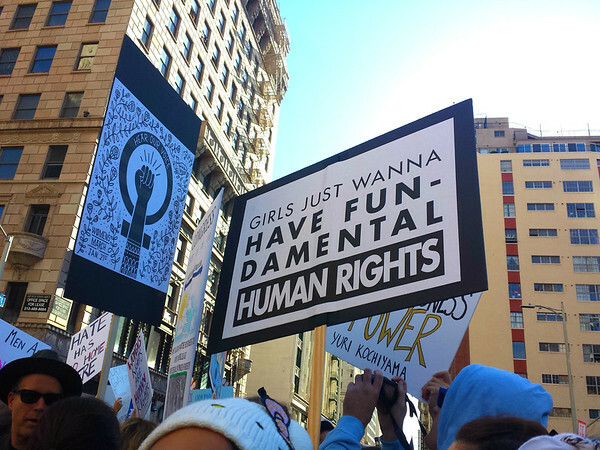 Why I marched: for human decency and to fight injustice and inequality. Truth be told, when I originally booked my flight from Seattle to LA for January 20, it was to see Ali Wong’s stand-up comedy show at the Ace Hotel. She did all new material, and she totally killed it. Pretty much on par with her Netflix special – hysterically funny…raw…vulgar. I left there with my cheeks aching from so much laughter! 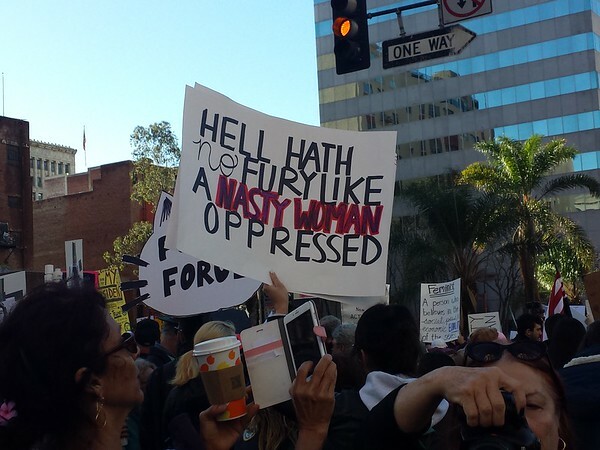 To have marched in LA though…you guys. It was life-changing. 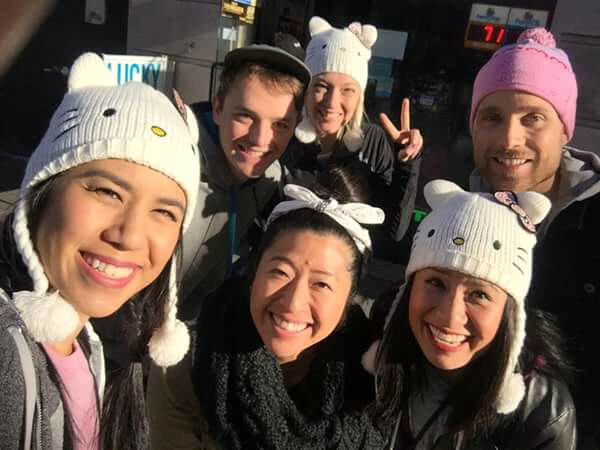 My sister and I met up with her friends Cobey, Maggie, Allen and Eddie at the North Hollywood metro station at 7:30am. Soooo early for a Saturday morning, and the march wasn’t even supposed to start until 10am. But thank goodness we got there when we did – the parking lot at the metro station was nearly full already! And metro riders rode free that day, in special recognition of the march. Thanks LA Metro! We boarded around 7:45am. The train was packed with fellow marchers, and our destination (Pershing Square) was 13 stops away. On the train alone, you could feel the energy…the solidarity…the desire for justice…the peace and kindness. 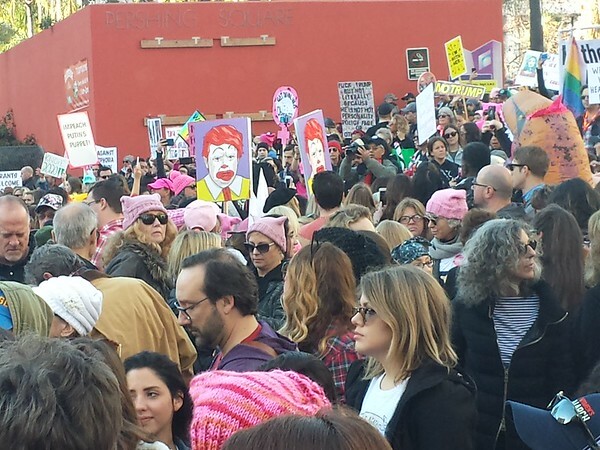 A sea of pink pussyhats, protest signs, balloons. Everybody was smiling, even when we were getting squished together as new marchers joined us at every train stop. It was a beautiful chaos. 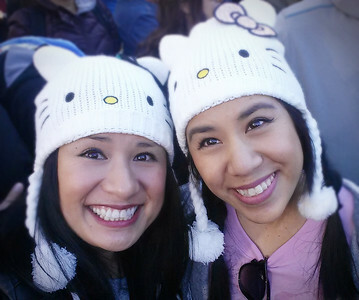 We weren’t able to knit our own pussyhats, but my sister and I had gone to the Burbank Target the night before and cleaned out their supply of Hello Kitty hats in the children’s section. Ha! And did I mention the weather?! 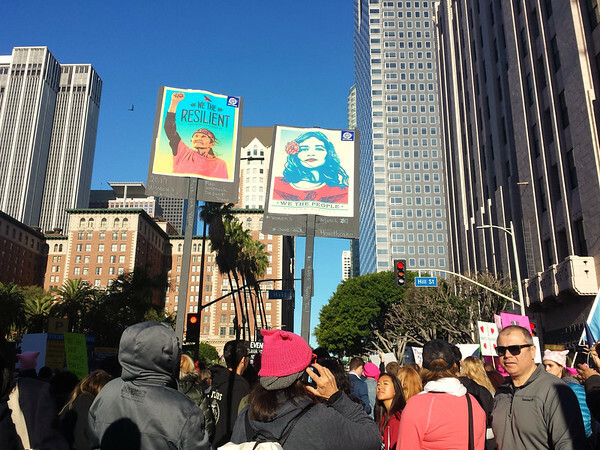 Southern California’s had unusually heavy rains and stormy weather this January, but for this one day – the day of the Women’s March – the clouds parted and the sun came out to make for a perfect, gorgeous day! The rain returned immediately that night, but Mother Nature had made sure to clear the way for us during the march. Although…”march” isn’t quite the right word for what we did that day. The city expected a crowd of 80,000 people, and ended up with an estimated 750,000 people!!! 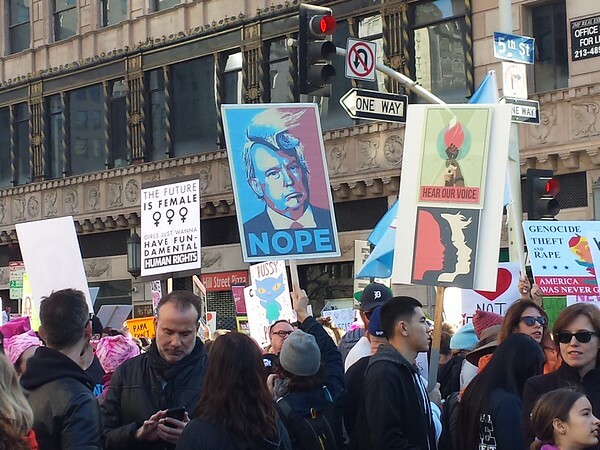 The intended route from Pershing Square to City Hall was completely gridlocked. 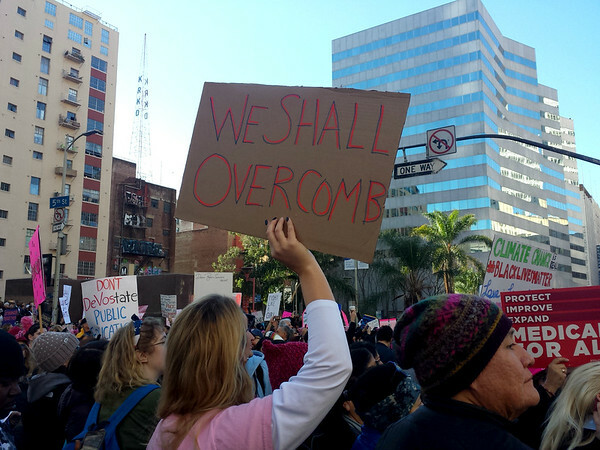 There was literally nowhere to march. Incredible. It overwhelmed me with pride and faith in humanity that so many people showed up to fight, to take a stand. There were women, men and children of all ages and ethnicities. And while people showed up to defend all sorts of rights from abortion to LGBTQ to affordable healthcare – the thread that tied us all together was decency. That we have to fight for this is a complete outrage. But to stand among so many decent people who also want decent things like justice and equality…it was refreshing and empowering. I mean, I already knew that the majority of my country was good and decent. But to be physically among them – so many of them – inspired me like nothing I’ve ever felt before. It changed my life. Drones and helicopters circled above us; people in the surrounding high rises waved down at us. The crowd burst out in spontaneous cheers. 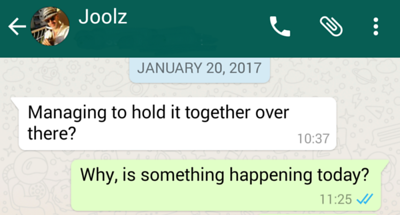 There was love and solidarity in the air. And can you believe 750,000 people and not a single arrest? Not even one. So what does one do when one cannot move? Well, at first, it was just confusing. The march time of 10am came and went, and on the ground, no one actually knew we were gridlocked. We just thought there was a delay. And at first, a delay is exactly what it was. 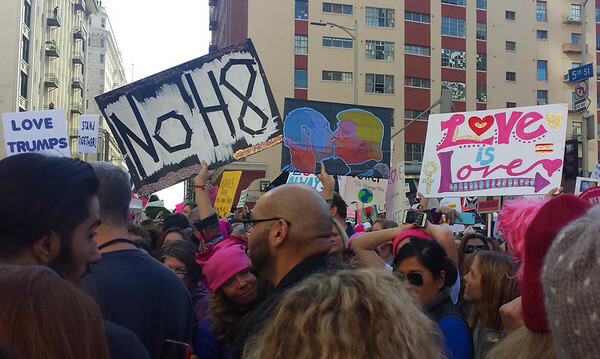 There were several celebrities at Pershing Square, and organizers wanted to get them to the front of the march before it started. Cue Miley Cyrus about three feet to my left, whose entourage was forcing a single-file flow through the crowd to get Miley to the front. 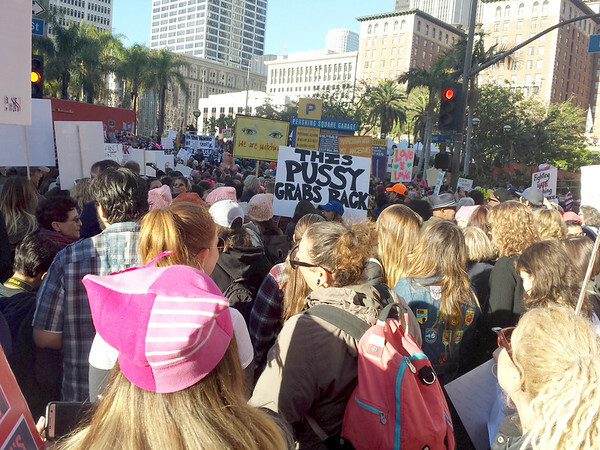 We were literally in the intersection of 5th and Hill which was the starting point for the rally, and the very tail end of the march route. So…since there wasn’t really a “march,” I’m not sure where the “front” ended up being for all the celebrities. I imagine they headed for City Hall, but that must’ve taken ages! In any case, having stood in the same place for about 3 hours, our gang decided we were gonna leave. Despite the spotty to non-existent data reception, my sister managed to get online and see news coverage revealing that we were gridlocked. It was time for us to go. As we made our way through the crowd to the metro station (this was no easy task, even though it was only about 100 feet! ), we realized a bunch of people had followed our lead, and started heading in the same direction. The crowd seemed to slowly disperse from the Pershing Square area and went rogue by marching down 5th Street! We beelined it to the metro anyway and hopped the first train back to NoHo. 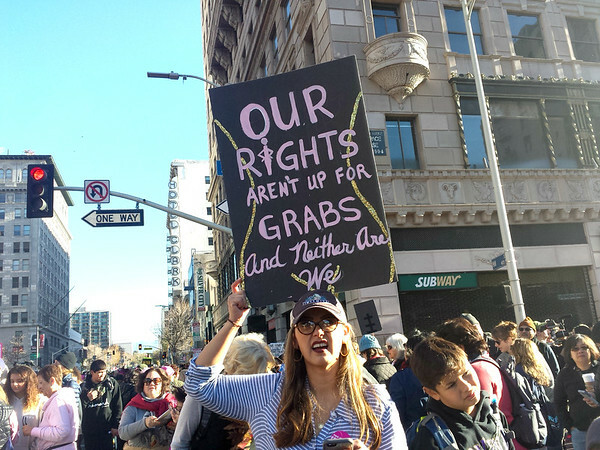 We came, we saw…we marched in place. It was great. As we left, there were still hundreds of people piling out of the trains to get to the march, and a huge crowd of people stuck inside the NoHo station, unable to get to the march at all. On the one hand, it was a bummer to see, but at the same time, it was beautiful. 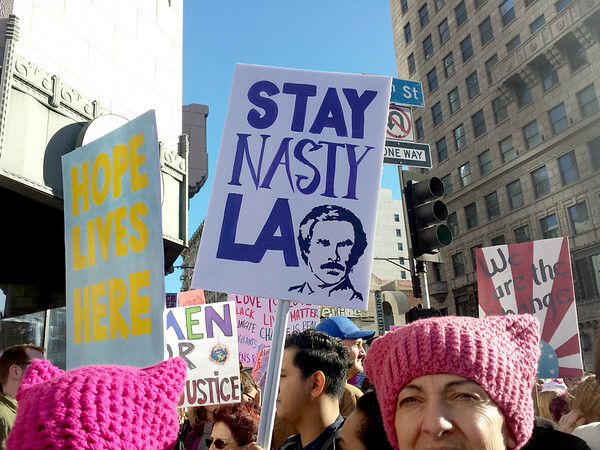 Everyone was in good spirits – those who were at the march, those leaving the march, those stuck on the metro, those stuck all the way in NoHo. 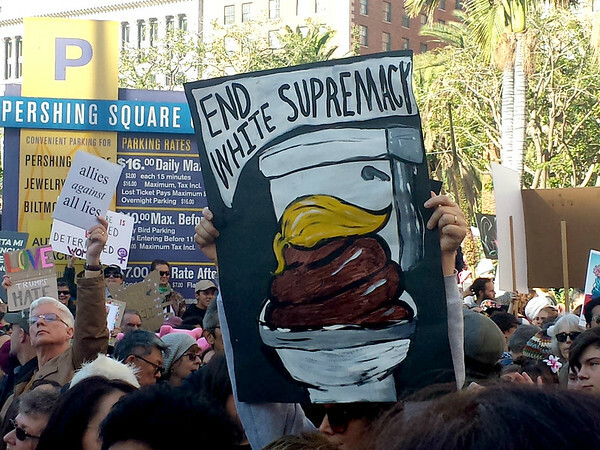 So many of us dedicated our entire day to standing up for basic decency, and good energy was all around. 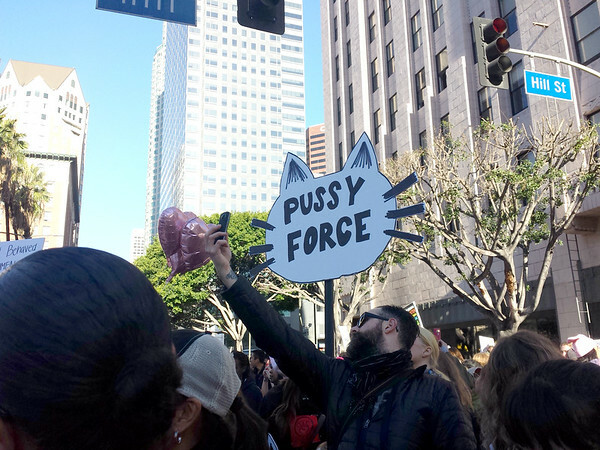 I will always remember my experience at the Women’s March LA. 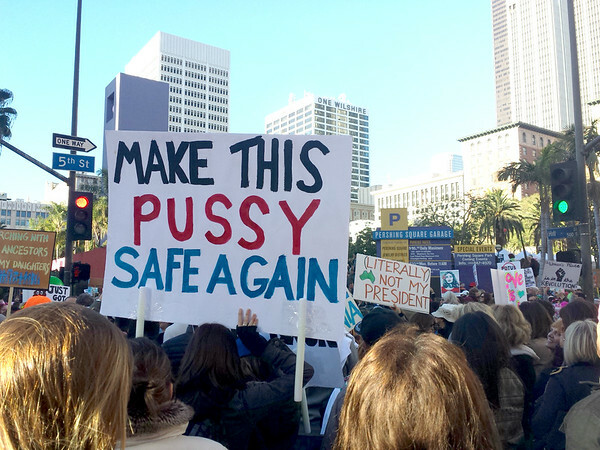 My heart was a-flutter for long after I’d left, reading about all the other marches, seeing that the march went international, watching some of the speeches online. My cousin Nhi had flown to DC for the march there, and what I was hearing from her was pure inspiration. I was overwhelmed with emotion and pride to have taken part in such a powerful display of solidarity. To help make history. 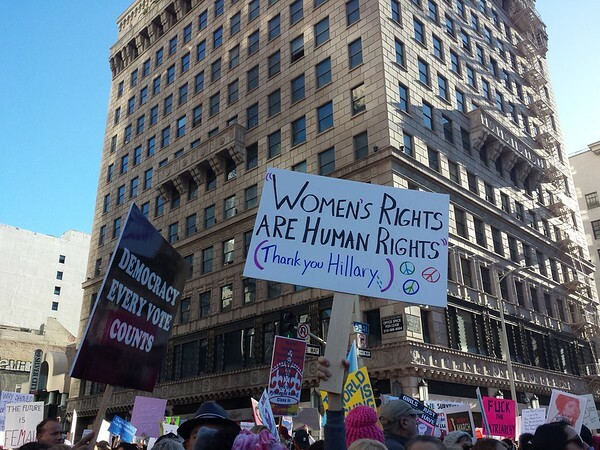 But the fight doesn’t stop with the Women’s March. I’ve since donated to the American Civil Liberties Union (ACLU), Planned Parenthood and a local LGBTQ organization called Pizza Klatch. And I’m going to keep on fighting. This administration is going to destroy our country if we don’t stand up and resist. I encourage you to donate, to reach out to your local representatives, to do your part to defend basic decency in our country. Whatever that means to you, whatever it is you care passionately about…fight for it. And remember: LOVE TRUMPS HATE.